How many grams should 18" and 28" dough balls weigh for the real deal New York style pies? I want to use 500 grams for and 18" pie and 1000grams for a 28" pie . What do you guys think? For each style of pie I make, I keep track of grams/sq. inch once I get the thickness right. 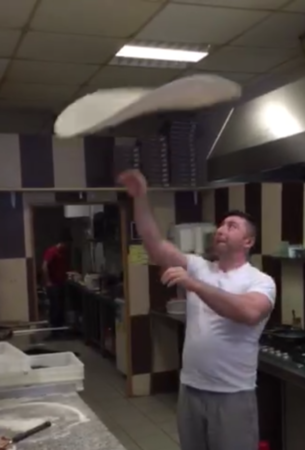 This way I can easily scale the weight of a dough ball up and down. For a 13" pie I use a 325 gram ball. This works out to 2.45 grams per square inch. For this thickness for an 18" ball, you can use a 623 gram ball. And for a 28" pie 1,507 gram ball. I'm assuming the 28" wasn't a mistake since it was mentioned twice in your post? That's ridiculously big and won't be easy to pull off. It'll fit in a commercial oven, and you'll need special pans and peels to make it work. Also, just in terms of stretching, it will be very hard to get right. Thank you for your answer. I use 230-250gr dough for 12" pizza. Above those numbers pizza is too thick for my taste. The reason i want to make 28" pie is that i want to offer the biggest pizza in my area. With 750gr dough i can stretch it 24 " without any problem. Wouldnt it a little bit doughy with 1500gr dough? The numbers I gave in my previous post will be a little thicker than your numbers. If you're going with 240 grams (average of 230 and 250 grams) for a 12" pie, then to get the same thickness for an 18" pie you would use a 539 gram ball. For a 28" pie you would use a 1,305 gram ball. Thank you Raj. Could you pls explain to me how you calculated it from the base dough 240gr. Absolutely. To do this calculation we want to find out the amount dough contained per square inch in your 12"/240 gram pie. To get the area of the 12" pie, we can use this equation: pi * r^2. 3.14 * 9 * 9 = 254 square inches. 254 square inches * 2.12 grams = 539 grams. You're lucky that Raj only gave you his simplified explanation. If Raj were actually talking with you, he'd tell you that you may need to make further adjustments because the formula he gave you was just a back of the envelope calculation, which assumes that the pizza is a disc, that is, a flat circle with no cornichon. Because your pizza has a cornichon, it's a combination of two shapes, It's more like a disc within a donut ring (or as Raj would say, a "torus"). The calculation of the volume of the ring is way complicated, but what Raj would tell you is that if you want the thickness of the disc portion of your dough and ring portion both to stay the same as the pizza gets bigger, the numbers he gave you will be a little low, so you should start with the numbers he gave you and then adjust. It all goes back to that pizza relativity thing. As usual, Adam's insight is spot on. I'd start with the dough weights we calculated in the previous replies. From there, you can easily make an adjustment.